This Blog: daily life in Jerusalem, thoughts on the peace process, on the people living in this country, brainstorming, dreams, personal stuff, etc. On Tuesday, I joined up with the All Nations Café (run by Dhyan and Daphna) who were having a hike from the beautiful Ein Lavan spring near the biblical zoo to the Palestinian village of Walaja. .
We were a small group of about 10 people at first, some of whom had accidentally discovered Haj Ibrahim's guest house and were staying there. The spring was packed with people, mostly young, orthodox Jewish people who glanced curiously at our mixed Jewish/Palestinian group. Daphna taught us a simple song with a circle dance to it - like a chant – which we sang over and over again, switching partners as we went around the circle – singing it in Arabic, English, Hebrew and Esperanto. "One people, one planet, one spirit, one people, one planet, one spirit, one people, one planet, one spirit – all we need is love!!" We sang this loud and often and some young Jewish teens asked us what our group was about. We asked them to join but they didn't, preferring instead to watch us. One of the girls was wearing a Camp Kobi Mandel t-shirt. Kobi Mandel was a young Jewish boy of 13 who was murdered by terrorists while he was playing with a friend in a cave near to his home. His mother has since set up a camp for Jewish relatives of terror victims. I thought about the connection of our group and the camp – thinking if we had a much bigger circle of people singing this together, thousands instead of just two-digit numbers, there would have been no need to set up this camp and this poor mother's young son might have been alive today. We began our hike down the mountain, by the side of the railway tracks, to a dried up riverbed. I spoke with a young girl from the Shuafat refugee camp. I don't often meet people from Palestinian refugee camps and I was happy that she was a regular member of this group. I, and other Israelis, often think of those living in refugee camps, as the most militant of Palestinians. Who would have thought that some would join a group such as this? Later in the evening there would be others from the Dehaishe refugee camp in Bethlehem who joined up with us. Halfway through our hike, we ended up in Ein Haniyeh spring, off the old road to Gush Etzion. One of the Palestinian men took away my water bottle to fill it up at the spring. What do I know. To me, you fill up your water bottles from tap water or from the spring water you buy at the store. I would never have thought to have filled it up here - such a city chick I am. 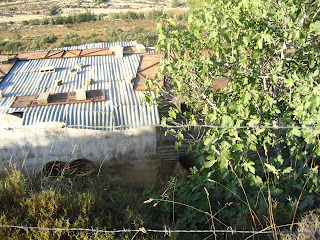 We made our way up the mountainside to Abu-Abdullah's home which was a ramshackle of a home which he stays in by himself, leaving his family up the hill at the village of Walaja. 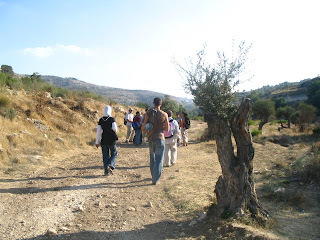 On the way there, the Palestinians took a few pinches of something off a tree – which was the sumac spice. I tasted it – it was extremely pungent – like eating Mike and Ike's Zour candies – only presumably much healthier. 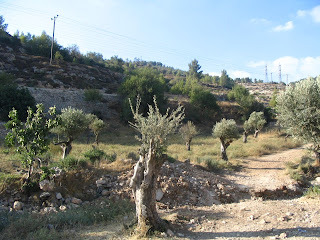 The reason for Abed Abu-Abdullah living in this place are the 200 fruit trees he has on the lands surrounding the old home – olive, grape vines, and who knows what else. The army had tried to remove him and his groves but he steadfastly refused, showing them ownership papers he had from his grandfather. 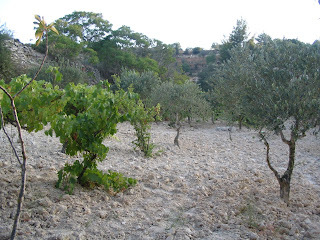 He was supposed to have taken us to see a holy 4,000 year old olive tree somewhere nearby, which people say, has miraculous healed anyone who eats olives from this tree. But he was in a bad mood, someone explained, and he has to be focused in order to take us there. 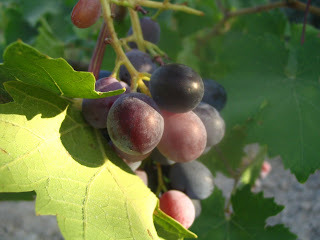 Bad mood and all, which I didn't feel by the way, he allowed us to pick the ripe grapes off his vines. He made us all coffee and some of us had brought snacks to share. My new friend from the Shuafat refugee camp remarked sadly how there are no trees at all in her refugee camp, as we munched on the same bunch of grapes together. The groves on the hill made the entire place seem so enchanting. 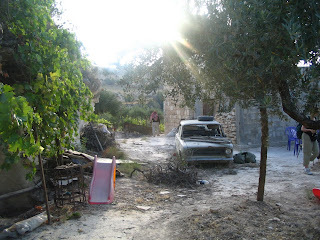 There was something very magical about it that no wonder there's a healing ancient olive tree nearby. At dusk we went down the hill for the main gathering near an abandoned house by the roadside, which also belongs to Abu-Abdullah's family. There more Palestinians awaited us – many of whom were from the Bethlehem area. A bonfire was lit and we were now a group of nearly 30 people. I felt a lot of empathy these past two days because being in their "hood" I experienced the discomfort of going through a checkpoint from Dr. Dejani's home with a miserable soldier, who shouted at us to move our car back. We wondered why the anger and someone suggested that perhaps to smile and show niceness wasn't allowed. It can be mistaken for a sign of weakness, something the Israeli army wouldn't dare want to show to outsiders. And now, as it became dark, and we were merely shadows from the road, an army jeep stopped in front of us, only the top of the jeep was visible through the trees. "COME OVER HERE - NOW!!!!" Let me tell you. To be shouted at like that by Israeli soldiers is quite frightening. Even for an Israeli like myself. And it happens to Palestinians all the time. It just happens to me when I'm hanging out with them. We answered them back in Hebrew, but they weren't satisfied. Daphne, one of the organizers of the group, and a native Israeli, went down the hill to speak to them. After about 5 very long minutes she returned. "They change soldiers here like they change underpants. The soldiers at the checkpoints know we meet here every week, but when they change the soldiers at the checkpoints, we have to explain about our group over and over again to them. Everything is ok now." Back at the bonfire, going around the circle, we shared a little about ourselves and we drank more coffee (and I couldn't fall asleep that evening until 2:00 a.m.) and a debka teacher taught us some debka steps, which we practiced over and over again to the music of darbukas and then from Arabic music from someone's cellphone. The glow of the fire shone on the face of everyone there. I hate to sound so hokey, but it did put warmth in everyone's hearts. There's nothing like sitting around a fire. It's soothing. People bond around a bonfire, don't they? Well, it seemed that even though there was a language barrier as many of the 17 Palestinians there didn't speak either English or Hebrew, they said they were touched by the fact that we (Jews) were there. It gives them hope in a world that seems hopeless. 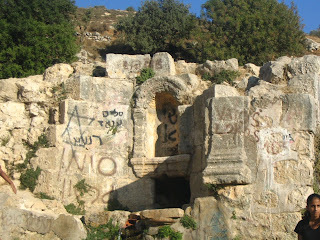 Wonderful post,Leah,hiking in the Land of Israel and seeing the history of the Jewish People in southwestern Jerusalem . Yeah - hiking in the Land of Israel also gives you the "other" perspective of other peoples in our midst - if you have your eyes open wide enough. 30C is nothing these days. Now, we're pushing 40C. I'm not drinking enough either - but I better start before I start looking prunish.